Title Liber Vitae of Newminster and Hyde, with register, charters, customs, the will of Alfred the Great, benedictions and order of Mass, etc. Decoration 2 full-page and 1 half-page ink drawings with some colours and a wash of green, blue or red (ff. 6-7). Large and small simple initials in blue, brown, red, or green, 2 with penwork decoration in brown (ff. 42, 44). Rubrics in colour. Highlighting of initials in brown or red. Decoration 4 small initials in gold on blue or brown grounds with penwork decoration and small gold balls. Binding Post-1600. Green leather with gold tooling and stamped Astle arms; marbled endpapers. Provenance The Benedictine abbey of Hyde (New Minster): presentation miniature of King Cnut and Queen Emma, 1031 (f. 6); list of the monks of Hyde Abbey, beginning with 'Aelfwine Abbod Sac', probably elected by 1032 (f. 21v) (see The Heads of Religious Houses: England and Wales 940-1216, ed. by David Knowles (Cambridge: Cambridge University Press, 1972), p. 81). Written principally by the monk Aelsinus (Aelfsige), who wrote parts of Cotton Titus D XXVI-XXVII between 1023 and 1032, according to Watson 1979; see also Orchard 2002 p. 90..
Added copy of a grant by William I to Riwallon, abbot of the New Minster, datable to 1070 (f. 41) (see Kidd). Walter Clavell, F. R.S., elected 1704, admitted to the Inner Temple in 1700, in 1710: inscribed with a note by Astle 'In the year 1710. This M. S. was in the possession of Walter Clavel Esq. It was afterwards the property of the Revd. W. North from whom it came to his precentor the Rev. Doctor Lort who presented it to me in the year 1770 T. A' (f. 69). George North (b. 1707, d. 1772), numismatist: see above inscription (f. 69). Michael Lort (b. 1724/5, d. 1790), antiquary, North’s executor: see above inscription (f. 69). Thomas Astle (b. 1735, d. 1803), archivist and collector of books and manuscripts, in 1770: see above inscription (f. 69); his signature: 'Tho. Astle March 25th 1771 (f. 5), with calligraphic account and contents of the manuscript on parchment, probably commissioned by Astle (ff. 1-5); his arms on the binding. Richard Temple-Nugent-Brydges-Chandos-Grenville (b. 1776, d. 1839), 1st duke of Buckingham and Chandos, of Stowe House, near Buckingham. Richard Temple-Nugent-Brydges-Chandos-Grenville (b. 1797, d. 1861), 2nd duke of Buckingham and Chandos: sold in 1849 to Lord Ashburnham: inscribed with the press-mark 'XXXI' (outside upper cover) corresponding to his catalogue Press III no. 31; see O’Conor 1819. Bertram Ashburnham (b. 1797, d. 1878), 4th earl of Ashburnham, of Ashburnham Place, Sussex. Bertram Ashburnham (b. 1840, d. 1913), 5th earl of Ashburnham: purchased by the British Museum from him together with 1084 other Stowe manuscripts in 1883. According to Wormald 1963, the manuscript was almost certainly kept on the high altar. This manuscript was formerly Stowe 960. Added notated Exultet (f. 50-50v). Select bibliography Charles O'Conor, Bibliotheca Ms. Stowensis: A Descriptive Catalogue of the Manuscripts in the Stowe Library, 2 vols (Buckingham: Seeley, 1818-1819), II, pp. 39-42. M. Digby Wyatt, The Art of Illuminating (London: Dan and Son Lithographers, 1860; repr. Studio Editions, 1987), p. 23. Catalogue of the Stowe Manuscripts in the British Museum, 2 vols (London: British Museum, 1895-1896), I, no. 944. Liber Vitae: Register and Martyrology of New Minster and Hyde Abbey, Winchester, ed. by Walter de Gray Birch, Hampshire Record Society (London: Simpkin, 1892). The Palaeographic Society: Facsimiles of Manuscripts and Inscriptions, Second series, ed. by Edward Augustus Bond, Edward Maunde Thompson, and George Frederic Warner (London: Cloves and Sons, 1884-1894), I, pls 16, 17. J. A. Herbert, Illuminated Manuscripts (London: Methuen, 1911), pp. 117-18, pl. XIII. Schools of Illumination: Reproductions from Manuscripts in the British Museum, 6 vols (London: British Museum, 1914-1930), I: Hiberno-Saxon and Early English Schools A. D. 700-1100, pl. 13. [J. A. Herbert], British Museum: Reproductions from Illuminated Manuscripts, Series 2, 3rd edn (London: British Museum, 1923), pl. 6. [J. A. Herbert], Illuminated Manuscripts and Bindings of Manuscripts Exhibited in The Grenville Library, Guide to the Exhibited Manuscripts, 3 (Oxford: British Museum, 1923), no. 14. H. P. Mitchell, 'Flotsam of Later Anglo-Saxon Art-I and II', Burlington Magazine, 42 (1923), 63-72; 162-69 (pp. 64, 167, pl. II). 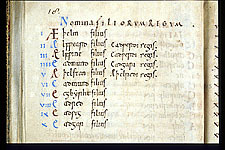 R. Priebsch, The Heliand Manuscript Caligula A. VII in the British Museum: A Study (Oxford: Clarendon Press, 1925), p. 27. Eric. G. Millar, English Illuminated Manuscripts from the Xth to the XIIIth Century (Paris: Van Oest, 1926), pl. 25. Guide to an Exhibition of English Art gathered from Various Departments and held in the Prints and Drawings Gallery (London: British Museum, 1934), no. 85. D. Talbot Rice, English Art 871-1100, Oxford History of English Art, 2 (Oxford: The Clarendon Press, 1952), pp. 203-04, 217-18, 232, pls 81, 84. Francis Wormald, English Drawings of the Tenth and Eleventh Centuries (London: Faber & Faber, 1952), pp. 17, 34, 39, 59, 64-65, 69, 72, no. 42, pl. 15 [with additional bibliography]. C. R. Dodwell, The Canterbury School of Illumination 1066-1200 (Cambridge: University Press, 1954), p. 119. English Historical Documents (London: Eyre & Spottiswoode, 1955- ), I: English Historical Documents c. 500-1042, ed. by Dorothy Whitelock, no. 96. N. R. Ker, Catalogue of Manuscripts Containing Anglo-Saxon (Oxford: Clarendon Press, 1957), no. 274. G. R. C. Davis, Medieval Cartularies of Great Britain: A Short Catalogue (London: Longmans Green, 1958), no. 1050. Francis Wormald, 'Late Anglo-Saxon Art: Some Questions and Suggestions', in Studies in Western Art: Acts of the Twentieth International Congress of the History of Art, 4 vols (Princeton: Princeton University Press, 1963), I: Romanesque and Gothic Art, 19-26 (pp. 25-26). Medieval Libraries of Great Britain: A List of Surviving Books, ed. by N. R. Ker, 2nd edn, Royal Historical Society Guides and Handbooks, 3 (London: Royal Historical Society, 1964), p. 103. Margaret Rickert, Painting in Britain: the Middle Ages, 2nd edn (London: Penguin Books, 1965), p. 42, pl. 37a. Illuminated Manuscripts Exhibited in the Grenville Library (London: British Museum, 1967), no. 5. Franz Ronig, Die Buchmaleriei des 11. und 12. Jahrhunderts in Verdun (Cologne: n. pub., 1967), p. 198 n. 619. Janet Backhouse, 'Manuscript Sources for the History of Mediaeval Costume', Costume: Journal of the Costume Society, 1 (1968), 9-14 (fig. 1). P. H. Sawyer, Anglo-Saxon Charters: An Annotated List and BIbliography, Royal Historical Society Guides and Handbooks (London: Royal Historical Society, 1968), no. 1507. A. Boutemy, 'Calendrier anglais illustré', Bulletin de la Société Nationale des Antiquaires de France (1970), 79-98 (pp. 88-89). T. A. M. Bishop, English Caroline Minuscule (Oxford: Clarendon Press, 1971), p. 23. Robert Deshman, 'Anglo-Saxon Art after Alfred', Art Bulletin, 56 (1974), 176-200 (p. 181). Elzbieta Temple, Anglo-Saxon Manuscripts 900-1066, Survey of Manuscripts Illuminated in the British Isles, 2 (London: Harvey Miller, 1976), no. 78, pp. 22, 88, 93, 94, 113, 120, pls 244, 247-48 [with additional bibliography]. Andrew G. Watson, Catalogue of Dated and Datable Manuscripts c. 700-1600 in The Department of Manuscripts: The British Library, 2 vols (London: British Library, 1979), no. 948. The Benedictines in Britain, British Library Series, 3 (London: British Library, 1980), no. 66 [exhibition catalogue]. The Vikings in England and in their Danish Homeland (London: Anglo-Danish Viking Project, 1981), p. 152, pl. on p. 153 [exhibition catalogue]. C. R. Dodwell, Anglo-Saxon Art: A New Perspective (Manchester: Manchester University Press, 1982), pp. 97, 175, 201, pls 23a, 23b, 47. The Golden Age of Anglo-Saxon Art, ed. by Janet Backhouse, D. H. Turner, and Leslie Webster (London: British Museum, 1984), no. 62 [exhibition catalogue]. Francis Wormald, Collected Writings, ed. by J. J. G. Alexander, T. J. Brown, and Joan Gibbs, 2 vols (London: Harvey Miller, 1984), I: Studies in Medieval Art from the Sixth to the Twelfth Centuries, pp. 107, 110, 120, pl. 114. Hartmut Hoffmann, Buchkunst und Königtum im ottonischen und frühsalishchen Reich, Schriften der Monumenta Germaniae Historica, 30, I-II, 2 vols (Stuttgart: Hiersemann, 1986), I, 23-24. T. A. Heslop, 'The Production of De Luxe Manuscripts and the Patronage of King Cnut and Queen Emma', in Anglo-Saxon England, 19, ed. by Michael Lapidge and others (Cambridge: Cambridge University Press, 1990), pp. 151-98 (p. 157 n. 16). Michelle Brown, Anglo-Saxon Manuscripts (London: British Library, 1991), p. 18, pl. 15. The Making of England: Anglo-Saxon Art and Culture AD 600-900, ed. by Leslie Webster and Janet Backhouse (London: British Museum, 1991), no. 240 [exhibition catalogue]. Les Vikings: Les Scandinaves et l’Europe 800-1200 (Paris: Association Française d’Action Artistique, 1992), p. 103, no. 412, fig. 6 [exhibition catalogue]. Milton McC. Gatch, ‘Piety and Liturgy in the Old English Vision of Leofric’, in Words, Texts and Manuscripts: Studies in Anglo-Saxon Culture Presented to Helmut Gneuss on the Occasion of his Sixty-Fifty Birthday, ed. by Michael Korhammer with Karl Reichl and Hans Sauer (Woodbridge: Brewer, 1992), 159-80 (p. 175 n. 75, pl. VIII). David N. Dumville, English Caroline Script and Monastic History: Studies in Benedictinism, A. D. 950-1030, Studies in Anglo-Saxon History, 6 (Woodbridge: Boydell Press, 1993), pp. 136, 140. Margaret Laing, Catalogue of Sources for a Linguistic Atlas of Early Medieval English (Cambridge: Brewer, 1993), p. 107. Heinrich der Löwe und seine Zeit: Herrschaft und Repräsentation der Welfen 1125-1235, ed. by Jochen Luckhardt and Franz Niehoff, 3 vols (Munich: Hirmer, 1995), I, no. D 115 [exhibition catalogue] [with additional bibliography]. 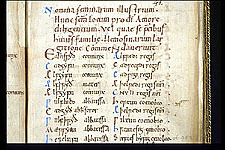 The Liber Vitae of the New Minster and Hyde Abbey Winchester: British Library Stowe 944, together with leaves from British Library Cotton Vespasian A. VIII and British Library Cotton Titus D. XXVII, ed. by Simon Keynes, Early English Manuscripts in Facsimile, 26 (Copenhagen: Rosenkilde and Bagger, 1996). The Utrecht Psalter in Medieval Art: Picturing the Psalms of David, ed. by Koert van der Horst, William Noel, and Wilhelmina C. M. Wüstefeld (Utrecht: HES Publishers, 1996), pp. 144-45, 246, 250, 252, fig. 43. Janet Backhouse, Pictures from the Past: Using and Abusing Medieval Manuscript Imagery, Medieval Research Centre: Text and Studies, 1 (Leicester: University of Leicester, 1997), p. 9, pl. 1. Pauline Stafford, 'Emma: The Powers of the Queen in the Eleventh Century', in Queens and Queenship in Medieval Europe, ed. by Anne J. Duggan (Woodbridge: Boydell Press, 1997), pp. 3-26 (pl. 1). Janet Backhouse, The Sherborne Missal (London: British Library, 1999), p. 37. Maylis Baylé, ‘Architecture et enluminure dans le monde normand’, in Manuscrits et enluminures dans le monde normand (Xe-XVe siècles), ed. by Pierre Bouet and Monique Dosdat (Caen: Presses Universitaires, 1999), pp. 51-68 (p. 57). Peter Kidd, 'A Re-examination of the Date of an Eleventh-Century Psalter from Winchester (British Library, MS Arundel 60)', Studies in the Illustration of the Psalter, ed. by B. Cassidy and R. M. Wright (Stamford, Lincs. : Shaun Tyas, 2000), pp. 42-54 (p. 46). Michelle Brown, 'Female Book-Ownership and Production in Anglo-Saxon England: The Evidence of the Ninth-Century Prayerbooks', in Lexis and Texts in Early English: Studies Presented to Jane Roberts, ed. by Christian J. Kay and Louise M. Sylvester, Costerus New Series, 133 (Amsterdam: Rodopi, 2001), pp. 45-68 (p. 59). Helmut Gneuss, Handlist of Anglo-Saxon Manuscripts: A List of Manuscripts and Manuscript Fragments Written or Owned in England up to 1100, Medieval and Renaissance Texts and Studies, 241 (Tempe: Arizona Center for Medieval and Renaissance Studies, 2001), no. 500. The Leofric Missal I, ed. by Nicholas Orchard, Henry Bradshaw Society, 113 (London: Henry Bradshaw Society, 2002), p. 90. Justin Clegg, The Medieval Church in Manuscripts (London: British Library, 2003), p. 13, pl. 9. Chris Fletcher, Roger Evans, and Sally Brown, 1000 Years of English Literature: A Treasury of Literary Manuscripts (New York: Harry N. Abrams, 2003), pp. 18-19. Maidie Hilmo, Medieval Images, Icons, and iIlustrated English Literary Texts: From the Ruthwell Cross to the Ellesmere Chaucer (Aldershot: Ashgate, 2004), p. 96, fig. 28. K. D. Hartzell, Catalogue of Manuscripts Written or Owned in England up to 1200 containing Music (Woodbridge: Boydell Press, 2006), no. 195 (p. 337). 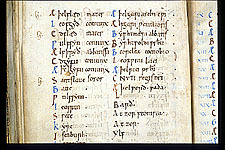 Michelle P. Brown, Manuscripts from the Anglo-Saxon Age (London: British Library, 2007), pp. 160-61 (plates). Catherine E. Karkow, 'Evangelist Portraits and Book Production in Late Anglo-Saxon England', in The Cambridge Illuminations: The Conference Papers, ed. by Stella Panayotova (London: Harvey Miller, 2007), pp. 55-63 (p. 55 n. 7). Margaret Scott, Medieval Dress & Fashion (London: British Library, 2007), p. 25, pl. 8. Treasures of Hyde Abbey, 6 March-2 May 2010 (Winchester: Winchester City Council, 2010), pp. 4-5 [exhibition catalogue]. Scot McKendrick, John Lowden, and Kathleen Doyle, Royal Manuscripts: The Genius of Illumination (London: British Library, 2011), no. 8 [exhibition catalogue]. Christian Heck, 'Liturgie et récits des origines dans l’art roman: les plaques émaillées d’Henri de Blois', Comptes rendus de l'Académie des Inscriptions et Belles-Lettres (January-March 2014), pp. 257-85. Liber Vitae of Newminster and Hyde, with register, charters, customs, the will of Alfred the Great, benedictions and order of Mass, etc.